9.5mm dynamic climbing rope. Thinner diameter means that it's lighter, more compact and provides better handling. By using state of the art yarns, Edelrid have produced a rope of reduced diameter without compromising technical standards. 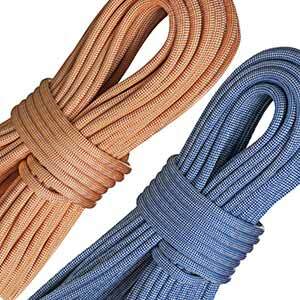 Ropes come direct from Edelrid so delivery make take up to 10 working days. Please call for a stock-check if required. With the Pro Shield finish every single core and sheath yarn is covered with a synthetic fluoropolymer coating that is stable and non-toxic. The microscopic (10-9 m) fluoropolymer particles are bonded to the yarns by an electro-chemical process forming an impermeable protective layer. This both reduces the friction between the individual yarns and increases the sliding properties of these yarns, which substantially improves the rope's loading properties. 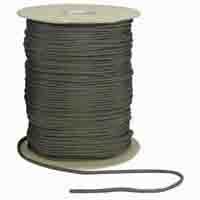 This helps the rope to withstand the external forces (falls) exerted upon it during climbing. Additionally, the rope is well protected against moist and dirty conditions. Dry Shield is a chemical finish for the sheath yarns. The finish is resistant to washing- out, providing a long lasting oleo and hydrophobic coating that keeps water, oily substances and dirt off the fibers. Together with the Thermo Shield treatment, the Dry Shield optimizes handling, abrasion resistance and performance. 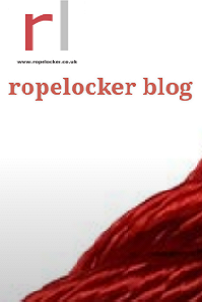 This all helps to improve the lifespan of the rope.